So, you’ve seen certain popular celebrities trying out this new trend. Have you ever considered waist training? If you have, we’ve got you covered! We’ve done all of our research to put together this corset buying guide to help you pick out the top corsets for waist training. We’ve separated the best from the rest so you don’t have to stress! First, let’s take a look at some of the things you should know before you go shopping. Color Options: This refers, of course, to the number of colors the corset comes in. Black, white, and beige are standard, but some come in more colors to make your waist training experience more customizable. Choose your favorite color! Size Range: You might be surprised to know that waist training corsets are not a one-size-fits-all product, and they are not on the standard US sizing chart. They range anywhere from XXS to 6XL and larger to benefit all body types. Material: Waist training corsets come in a range of materials, the most common of which are cotton and latex. They can also come in spandex, much the same as any other undergarment. Some are even made of more heavy-duty or luxury materials. Boning: Corsets were traditionally made with whalebone to help your body keep the shape. Modern corsets are boned with steel most commonly, though plastic is a cost-effective alternative. They are lighter and a bit more comfortable than their ancestors. Style: Different Styles of corsets cover different parts of your body. The main difference in style refers to whether the corset covers your bust or rests underneath it. Corsets that cover your best create a more overall slimming effect. Shoulder Straps: Is the corset strapless? Most are, but there are also some (especially in the over-bust style) that come with shoulder straps for additional support. It’s all about which style you prefer, as both work great for waist training. So now that you know what to look for, we can get to our corset reviews! We’ve combed the internet to bring you a selection of the best corsets for sale right now, with an emphasis on which will work best for waist training exercises. If you’re in a hurry, check out our top pick and budget pick first, as they’re our favorites. The rest of the list has some great products, so check them out as well! Camellias Waist Trainer Corset comes in 8 stunning colors and a full range of sizes from extra, extra small to 6XL. There are 4 layers of fabric that help to make this corset, including a high-quality cotton lining and satin and latex outer layers that are laminated together for a more rigid design. There are 20 spiral steel bones running the length of this corset for excellent support, as well as 4 steel bars in the back area and two rigid bars at the busk. It’s one of the top-rated waist training corsets for a reason! Get the slimmer look you want in black, white, brocaded black and white, mesh black, and cotton varieties. It’s got a ribbon-laced back with corset cord to tie it closed and keep it closed – more traditional than hook-and-eye varieties. With the satin exterior, it’s great for costume parties or cosplay as well! 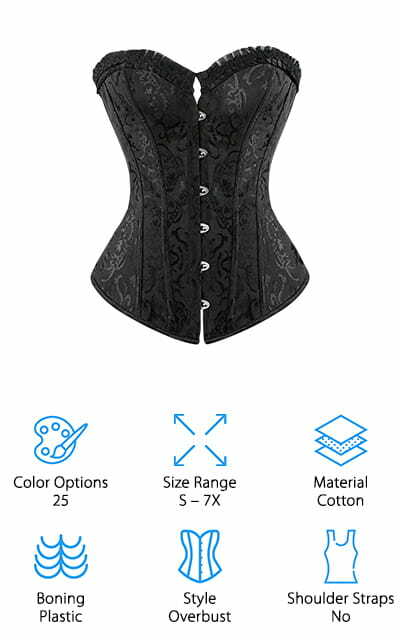 We love all of the support that this corset offers! 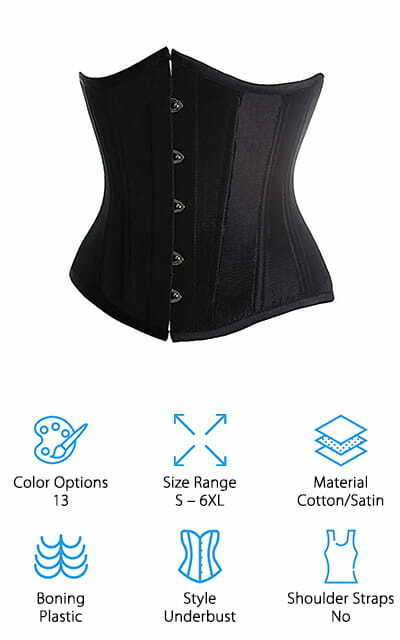 The Lover-Beauty Waist Training Cincher is one of the best cheap corsets for waist training! It comes in sizes ranging from extra, extra small to 6XL, so there’s a corset for every body type! The 9 spiral steel bones are flexible, but still rigid enough to help hold shape. They are more durable than plastic bones, but they are just as soft. With this corset will give you a smooth-looking waistline no matter if you wear it over your clothes or under them. The closure is 3 rows of hook-and-eye loops for tight securing. It will work for longer torsos as well, a common problem with other corsets. You can instantly reduce the look of your waist by 3-5 inches due to the high compression levels that this corset will give you! It comes in beige, black, breathable versions, cream, blue, purple, and pink, so you can pick your favorite color and make a statement! The YIANNA Waist Trainer Corset holds a place on our list of the top 5 waist training corsets because of its amazing flexibility. The boning is all steel, but it’s so soft and flexible you’d believe that it was plastic. As easy as it bends, it goes right back to its original shape without any kinks. The material is extremely breathable. Due to the design of the corset, it boosts thermal activity – so you sweat more, and it works very well for workouts due to its ability to increase body heat. Your workouts will be more effective! The design fits right under the bust, so it won’t restrict your airflow like over-bust styles tend to do. It closes snug and tight with 3 rows of hook-and-eye closures, and you can adjust it as you see fit. It’s almost like having three sizes in one! There are 11 different color options including purple and blue, and even a short version! This shapewear from Charmian comes in an astounding 23 colors, including red, orange, pink, apricot, and three different shades of purple and blue! Now you can get the slim, hourglass shape that you want in a number of colors and styles! For the best result, hook on the tightest row of hook-and-eye latches for the best fit. There are three rows so you can adjust perfectly even to your size! This model comes with shoulder straps for extra support, which integrates well with the underbust design. That’s a pretty unique design. Because of these straps, it also helps to shape your back and arms. The U-shaped bust design promotes anti-sagging and pushes your bust up to give you a great look! We love that this corset does more than just train your waist, but helps to give you a better figure overall! That’s why it’s a contender on our list for good corsets for waist training. The Alivila Y Fashion Trainer comes in sizes from small to 6XL, and a wide variety of colors including pinks, reds, purples, gold, blue and shades of brown and grey. You can also get fishnet varieties. There are 12 plastic bones nestled in this corset that are soft and flexible, but still sturdy enough to hold the shape. It’s got a busk closure with a lace-up back for style. There are even 2 steel bars adjacent to the busk for added support. There’s a 4.5-inch modesty panel to conceal the closures so your skin isn’t exposed, which makes this great for costumes. It’s lined in cotton for comfort. It’s one of the real corsets for waist training! It gives you a slimmer look instantly with a beautiful underbust design that won’t restrict your breathing. It’s sized with the corset completely laced shut and on a Non-US sizing system, so keep that in mind when ordering! 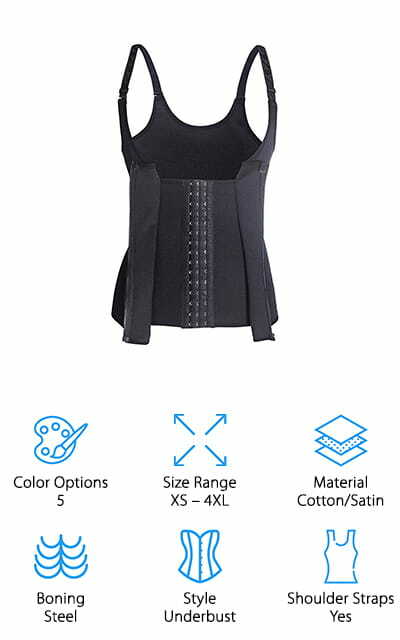 The FIRM ABS Waist Shaper definitely takes a rightful place in our list of quality waist training corsets. It comes in five beautiful, simple colors: apricot, black, blue, pink and purple. There are three different rows of hook closures for size differences even within a certain measurement. The hooks are square in order to get a tighter fit. 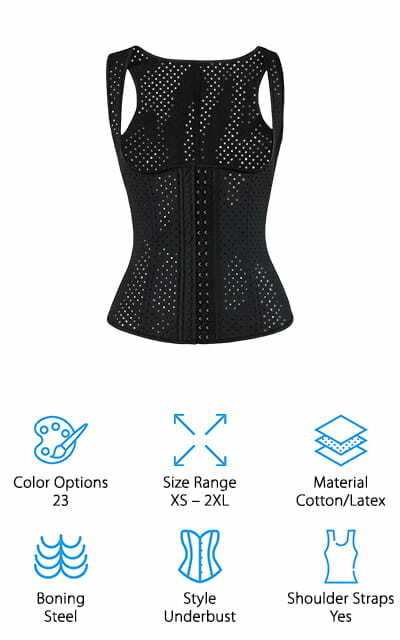 This corset helps improve posture and works well with its flexible steel bones. They’re soft enough that they feel like plastic bones, but they easily retain their shape. It’s meant to be hand washed, dependent on how much you wear it. But you can wear it over your clothes or under them if you want to wear it while working out or as underclothes. It helps reduce sweat to keep you feeling dry and great during the day. It uses a special sizing chart that you will need to follow when ordering to make sure that you get a perfect size! The Frawirshau Body Shaper comes in 25 astounding varieties and colors, including striped versions, black, black with red accents, blue, pink, and red, as well as green, purple, and white. It looks very vintage; it has the old heart shape that goes over your bust. This unique look makes it perfect for costumes and nightlife as well. It looks great with any outfit, and you’ll feel perfect! It gives you the hourglass figure and slimming effect that you look for in a corset. It rates very well on our list of high-quality waist training corsets – and we’re sure that you’ll love it! 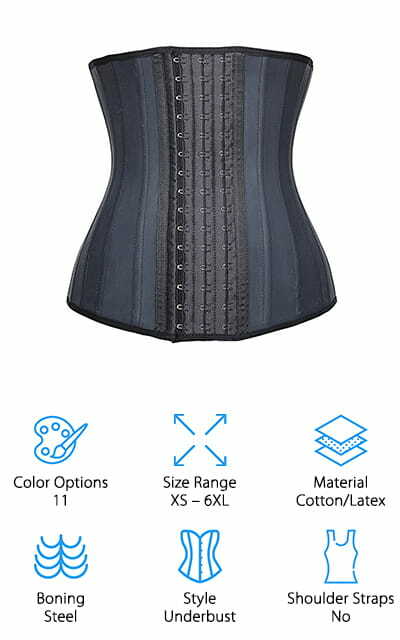 There is a handy measurement chart so you know which size to order; this corset has a unique sizing system that works only with this piece of clothing. We love that the design goes over your bust, and the vintage heart-shape is really cute! We think that you’ll love how this looks and feels! The Gotoly Waist Cincher is unique on our list for its zipper closure that zips perfectly over the inner hook and eye closure, for a double-assurance that it’s going to stay tight; just secure the hooks first and then zip over them for a perfect fit. It’s got an open bust design so it doesn’t interfere with your breathing, and you can make it tighter or looser as you see fit, or as your waist training progresses. It pushes up your bust and slims your upper arm area, as well as your back – the shoulder straps give it a perfect amount of support so you can feel secure. The beige and black variations give you a level of customizability for your workout routine. Get your best look with this waist training corset and cincher. It’s great for undergarment shapewear and for working out as well; it helps you sweat more when you work out! The FOMANSH Body Shaper works hard to define your waistline! 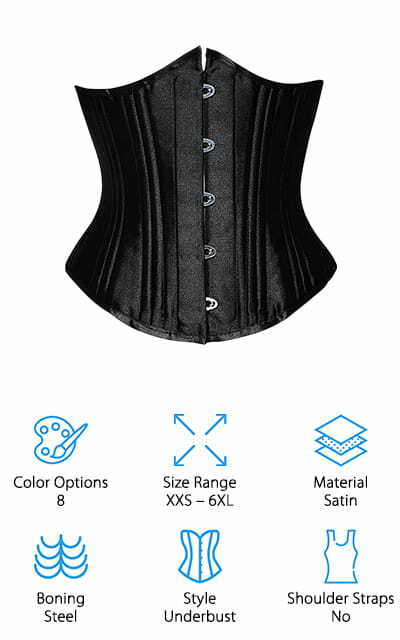 There are an amazing 25 flexible steel bones in this corset, for a tight and defined fit that you can’t help but love! Your waist instantly looks three sizes smaller with the compression in this corset. The hooks that keep it in place are made of metal and won’t tear out of the corset if you go for a super tight fit. You’re going to have to look at the sizing chart to make sure it’s the right size because even among other corsets these come in unique sizes. It’s made of high-quality latex to give you the best fit possible. It’s comfortable and beautiful to look at! You can work out in it and use it for daily wear as well. The inner lining is made of cotton, so it won’t feel too uncomfortable, even when it’s fully cinched tight. Look great and feel great too! The Ekouaer Waist Trainer is made of spandex with a satin, shiny outer layer. It comes in eight unique colors, each with zippered varieties, including leopard, gold, red, black, and purple. They look great and work very well! They can adjust for size within the sizing chart, so even after you measure yourself you can adjust the corset within your size range. For best results, use the bottom eyes first and work your way up to close the corset. It’s great for working out, shapewear, costume, undergarment for short stretches of wear. We love how cute these are, and all the different unique colors that they come in. It’s especially awesome that they have a leopard print option. Way to make a statement! As always, use the sizing chart, but most people have the most luck with ordering a size smaller than they measure for. Each corset has their own size ranges, so always check the chart.